I also did my best to include mostly small businesses (women-owned if possible), because I know it's as important to you, the tribe, as it is to me to support the people out there hustling and making it happen. Hope you enjoy my first gift guide! SHIRTS ARE BACK! You requested these like crazy so here they are! The pre-order window for these tank tops closes on Saturday the 9th so don't wait! If you're a CrossFitter, chances are good you've seen this bra swirling around on Instagram or even in your gym. It's designed to pad your collarbones from barbells, but you don't need to be a barbell user to appreciate how damn cute these bras are. These come in a TON of colors and styles, and the owner, Nicole, also makes leggings and other fun stuff. These days, people wear "busy" like a badge of honor. Thankfully, we have people like Steph who are working against that mainstream idea and encouraging people to take a step back, and unhustle. This is a great gift for your wellness or health minded friend who always loves new athleisure! This right here is the stuff that got me hooked on the oil cleansing method about 3 years ago. This small business' owner, Cassy, works hard to ensure only the highest quality ingredients goes into her products. I love the cleansing oil, the face oil, and the myrrhaculous face cream. 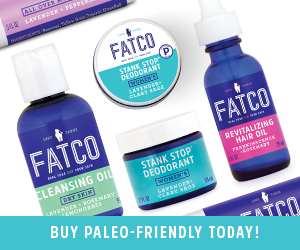 Fatco makes lots of different lotions and potions, and would be a welcome gift to anyone on the hunt for some amazing natural skincare! I had a hard time picking just one product from the Herbivore Botanicals lineup, because they are all so pretty. This is a Seattle based company that's really expanded recently, and their products are all as clean as they are cute. Such great stocking stuffers or gifts for office friends! Who doesn't love when tech + beauty combine forces? This gadget is a soft brush that gently exfoliates your skin and really makes your cleanser next-level effective. I'm a little late to this one (they've been around for a few years), but I'm impressed nonetheless. Great for your bestie, mom, or anyone who appreciates a little self care and healthy skin. P.S. Yes it works with oil cleansers! That's what I do every morning. These masks are trendy af, and for good reason: they are effective. I love that these come in small sample sizes so that you can gift them (or try them yourself!) without breaking the bank. Plus you can reuse the jar for travel. Who doesn't love the gift of clear, hydrated skin? Ditch the Hallmark and add some style to your cards this year, all while supporting a great local Seattle artist, Abby. Her work is all hand done, but it doesn't end with cards! You can also gift your budding entrepreneur friend some logo design work, custom stationary, screen print work and more. Raise your hand if you're obsessed with planners and all things organization!? This planner is a stand out because it's entire purpose is to support you hitting your goals. With things like daily action steps, motivational quotes, vision mapping, and more, this is such an awesome asset to anyone who has a vision for 2018. The owner, Jenny, also just released a fitness-only version of this planner for those Obligers out there who need a little extra help sticking to their plan! We got this throw as a wedding gift a few years ago and it's been a living room staple ever since. It's lightweight and adds a beautiful accent to the room, and we love it! I also spied this cozy, velvety throw and already have my eye on it... this one might be on my list! Bonus: it comes in a zillion colors. My husband and I got this as a gift last year, and we are completely and totally obsessed. If you ever wished you could text your dog, the technology is basically here. The features for the Furbo are too long to list here but I highly recommend this to anyone who has a fur baby! For that person who's always in the kitchen and looking for ways to either make things more interesting, or who appreciates fast + easy meals, these spice blends from Diane Sanfilippo are seriously amazing. Unique flavor combos, oversized jars, and totally clean ingredients make these stand out. A stocking stuffer with flavor! And a bottle of beautiful olive oil is never a wrong gift, amirite? We have an identical board that we use for cheese platters and every time we take it out, we get compliments. A great gift for the hostess or cook in your life, and at under $30, a total steal! Ok ok, are you sick of seeing this thing yet? I don't have one yet, but it is on my wishlist this year. The Instant Pot is all the rage right now, and for good reason. Chicken in 12 minutes, rice in 4, and a slew of other bells and whistles that are guaranteed to make your life easier and tastier. Does your gym buddy always complain about needing knee sleeves but never actually gets them? Hook her up with a pair of Exo sleeves, which are my favorite brand of sleeves. These come in handy for all squat variations, but I also use mine as a fail-safe shin protector on rope climbs. This company is owned by an awesome chick, Sloane, and sells way more than sleeves these days. Go check them out! Wanna gift your training partner a workout program that you guys can do together? And remember that if you're in the market for a book or cookbook, or other random things, you can always check out my all-time favorites (read: ride or die, go-to products) and recommendations in my shop tab!